The new "TracMe" aluminum wedge/roller horseshoe was unveiled today at the International Hoof Care Summit meeting in Cincinnati, Ohio. The new shoes are sized like raceplates and look like therapeutic shoes. The larger sizes have wider (some would say onion-esque) heels and optional clips. Trac Me is the project of metals manufacturing pro Mary Lovejoy of Versailles, Kentucky. A few years ago, her mare Zena developed laminitis and was a patient at Rood and Riddle Equine Hospital’s podiatry unit, under the care of Dr. Scott Morrison and farrier Manfred Ecker. Mary became intrigued with the clinic's display of aluminum shoes made by Manfred, or offered by different manufacturers. And she thought she could do better. When Zena recovered, she became determined to bring her metal trades background to the farrier world, and TracMe shoes became a full-fledged business plan. The preliminary shoes were designed by Manfred Ecker and tested by top farriers like Dr. Scott Morrison, Mike Wildenstein (Cornell University), Jay Thomlinson (Virginia) and James Gilchrist (Palm Beach Equine Clinic). Aluminum milling has been a state of the art process for making shoes for almost ten years now. The demand for aluminum egg-bar shoes sent GE Forge and Tool’s KB shoe line to the top of the class when GE’s Bob Garner went high-tech and mastered the aluminum extrusion and computerized milling process. The result was a streamlined horseshoe that didn’t break because (in a nutshell) the aluminum “flowed” around the form of the shoe instead of across the form. Major improvement! TracMe shoes retail for $36 a pair and up. Our trusty reporters on the trade show floor at the farrier meeting in Cincinnati report that one of the most unique items they have seen is the "Shoe-Tru" device. It is an oversized toe clip with a magnet that adheres to the shoe. Assuming that the toe of the shoe is "out there" with the toe of the foot, not set-back, the clip holds the shoe in placing for safer, more steady nailing. Once the nails are in, the farrier just slips the clip off the shoe. 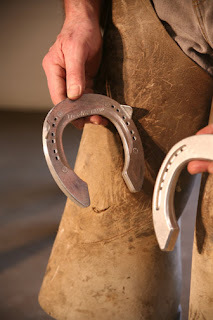 Many farriers lament the unpopularity of toe clips on USA horse shoes; most people use side clips. Users of both types of clips site the ease of nailing on a clipped shoe. The magnetic clip may help with nailing, but not have the burn-in requirements of a "real" clip. There are some ingenious people out there! At around 10:30 this morning, after spending a restless night on his feet in his stall at New Bolton Center, 2006 Kentucky Derby Barbaro was euthanized by his surgeon Dr. Dean Richardson. 1. The decision to euthanize Barbaro was not related to a re-fracture of his leg. To take weight off his foundered left hind, Barbaro bore increased weight on the right hind and severely bruised the lateral heel, which lead to an abscess in that heel area. 2. Barbaro did develop laminitis in both front feet. 3. On Sunday night, Barbaro did not lie down. Richardson said the horse is usually quiet at night and lies down to sleep. He did not do that last night and Richardson said it was the first night the horse had been in distress. The horse's distress was in spite of pain medication and the use of the sling. "We couldn't control his pain," Richardson said. 4. On Monday morning, Barbaro was relatively comfortable in his sling and alert. He ate his grass brought to him by his owners. He was given a heavy dose of tranquilizer and then an overdose of anesthesia through a catheter that was already in his neck. 5. "It could not have been more peaceful," Richardson stressed. In retrospect, Richardson commented, "There were some Eureka! moments. But this is how science works, it's more like a gradual accumulation of expertise. I am sure I made mistakes, or, I should say, I am sure there were things I could have done better. You have to believe that you will get better at your job, otherwise why would you go to work in the morning?" Referring to the cascade of events leading to the decision to euthanize the horse, Richardson said, "It's like a deck of cards. If one thing starts to go, others follow." "My only gratification," he said near the end of the conference, "Is that he had eight or nine months of being a happy horse a majority of the time." The press conference ended about 4:30 this afternoon. Word just in that 2006 Kentucky Derby winner Barbaro was euthanized this morning at New Bolton Center. More information to follow. Left: Barbaro's right hind leg as it appeared on radiographs in November. This leg is now equipped with an external fixation device for support; pins were surgically implanted through the leg to attach to a brace. "On Saturday, January 27, Barbaro was taken back to surgery because we could not keep him comfortable on his right hind foot. That foot developed a deep subsolar abscess secondary to bruising when he went through a period of discomfort on the left hind foot. It is not laminitis but the undermining of the sole and part of the lateral heel region are potentially just as serious. "We attempted to manage the right hind foot in a cast and then in a custom fabricated brace but it was impossible to have access to the foot for treatment as well as acceptable stability and comfort. "We elected to place his right hind in an external skeletal fixation device in order to provide the foot a chance to heal. This means that two steel pins have been placed transversely through his right hind cannon bone. These pins are connected to external sidebars that in turn are connected to a lightweight alloy foot plate. This results in the horse eliminating all weight bearing from the foot; the horse's weight is borne through the pins across his cannon bone. "There is significant risk in this approach but we believed it was our only option given the worsening of the right hind foot problem. The major risk of the external skeletal fixation device is that the bone bearing the weight can fracture. Unfortunately, we felt we needed to take this risk because this approach offered our only hope of keeping Barbaro acceptably comfortable. "He had a perfect recovery from anesthesia and has been in and out of the sling since then. His left hind foot appears to be stable at this time. We remain concerned about both front feet. Remarkably, his attitude and appetite were excellent overnight. "We will continue to treat Barbaro aggressively as long as he remains bright, alert and eating. This is another significant setback that exemplifies how complex his medical situation remains because both hind limbs have major problems." External fixation for laminitis and other conditions is not an unproven technique for New Bolton. The hospital's Dr. David Nunamaker is probably the world's leading expert on this type of support. Photos of similar fixations from Hoofcare & Lameness files will be added to this story when I am back in the office. "He's got a lot of issues, and not any of them is bad enough to say goodbye. But put together it's not a good day for Barbaro," Mrs. Jackson told Mike Jensen of the Philadelphia Inquirer. Scott Morrison DVM, consultant on Barbaro's foundered left hind foot, was at home in Kentucky yesterday. Journalist Jensen recently won an Eclipse Award, racing's highest honor, for his reporting on Barbaro. He is basically embedded at New Bolton Center, somewhere near the reception desk. "The success of Deep Impact, an unremarkable-looking racehorse, is down to his incredible stride, extensive scientific data revealed. "Dr Hiroko Aida, from the Japan Racing Association, displayed the running form of Deep Impact in the veterinary science workshop at the 31st Asian Racing Conference in Dubai. "A host of measurements were taken from high-speed video data of the Kikuka Syo (Japanese St Leger) at a rate of 250 frames per second. "Sophisticated analysis has revealed that the champion racehorse’s ratio of overlap time to stride duration was 8.5 per cent, compared to that of an average horse, which is 17.1 per cent. "It was postulated that this characteristic, which is also common to the great American horse Secretariat, may be an essential feature of superior horses. "Aida said that such video analysis could in the future identify the “next Deep Impact” before he hits the sale ring." Editor's Note: Deep Impact was Japan's superhorse. He retired this fall with earnings of 1.5 billion yen (about $13 million US). When Deep Impact traveled to France this fall for his gallant third-place finish in L'arc de Triomphe, chartered jumbo jets full of his fans accompanied him. Deep Impact is one of many stakes-winning offspring of American champion Sunday Silence, who stood at stud in Japan before his death caused by laminitis. “Barbaro was placed under anesthesia yesterday to have his left hind foot cast replaced,” said Dr. Dean W. Richardson, Chief of Surgery. “We also removed the cast on his right hind leg and replaced it with a custom-fabricated plastic and steel orthotic brace to give his foot additional support.” An abscess near the lateral heel of his right hind foot was drained, and the brace that was applied will allow more regular treatment of that foot. The WALTHAM® Equine Studies Group and the Royal Veterinary College have joined forces to host a laminitis conference at The Royal Veterinary College at North Mymms, Hertfordshire (England) on Saturday 24 March 2007. Targeted at vets, researchers and others interested in the condition, the conference includes recent research findings and advice with respect to laminitis. Pat Harris PhD MRCVS, head of the WALTHAM® Equine Studies Group will chair the conference; she said: "This conference should bring you up to date with the current thinking on the pathophysiology of laminitis and how to manage affected animals. In addition, we will provide exciting new insights into ways that may help us to predict which animals are more likely to suffer from this debilitating condition, as well as management strategies that may reduce the risk of an episode occurring." The program covers key aspects of laminitis, its possible causes and management regimens. Dr Annette Longland BSc, PhD will discuss "Starch, sugar, and fructans: what are they and how important are they?". Jonathan Elliott MRCVS (Professor of Veterinary Clinical Pharmacology) will look at new insights into the cause. Ray Geor PhD, DACVIM will examine the role of obesity and insulin resistance. Pat Harris will cover the nutritional counter-measures to laminitis. Celia Marr PhD, MRCVS will examine the medical management of the acutely laminitic Horse. Simon Curtis FWCF HonAssocRCVS will explain the role of the farrier in the management of laminitis. Nicola Menzies-Gow MRCVS (Lecturer in Equine Medicine) will provide insights based on various laminitis field studies. Jonathan Elliott will present a paper by Simon Bailey MRCVS (Lecturer in Veterinary Pharmacology) examining how an increased risk of suffering from this condition may be predicted now and in the future. To register for the conference please telephone Kerry Knight on (011+ from the USA) +44 (0) 1908 576258. The fee is £30 (approximately $60US), which includes lunch and a full copy of the proceedings. EDITOR'S NOTE: The Royal Veterinary College (RVC) is the UK's first and largest veterinary school and a constituent College of the University of London. Equine laminitis has been a focus for researchers at the College for the past 15 years. The research team involved includes pharmacologists, endothelial cell biologists, bacteriologists, endocrinologists and epidemiologists. The group has made significant steps towards understanding the link between events in the gastrointestinal tract and failure of the dermal-epidermal bonds within the hoof laminae. Recent work has turned to understanding the factors making some horses and ponies particularly susceptible to bouts of laminitis. At last night's Eclipse Awards for "horse of the year" honors, the racing world waved good-bye to the stars of 2006. It was a great year for racing, although most of the nominated horses are injured or retired; one is even dead (Pine Island, who broke down in the Breeders Cup). Barbaro, nominated for top three-year-old honors, was no doubt watching the ceremony from a tv in his stall at New Bolton Center's ICU. He didn't win. He lost to Bernardini, the horse who kept on running and won the 2006 Preakness while Barbaro broke down near the start. Bernardini is already in Kentucky, with mares lined up for the breeding season that is starting now. At evening's end, Barbaro again ran second to Invasor as horse of the year. Invasor's story was one of the quirkiest of the year. He arrived from Uruguay as a surprise to his trainer, having been purchased on a whim by Hoofcare & Lameness subscriber Hassan bin Ali, who was in Uruguay buying endurance horses for Dubai's royal family. Hassan's next stop from Uruguay was the Hoofcare & Lameness office, where he grilled me, as usual, about new horseshoes and technologies that might be of use to his training program. But he also showed me videos (on his cell phone, of course) of the horses in Uruguay, and "this super racehorse". The next time I saw Hassan bin Ali was when he joined Invasor in the winner's circle at the Whitney Stakes in Saratoga. Invasor just kept on running, all year, and won the Breeders Cup Classic, defeating even Bernardini. And the best news is that Invasor will keep on running in 2007. Back home in Uruguay, I'm sure the crowd went wild. Congratulations! New Bolton Center's Dr. Dean Richardson was in the spotlight at last night's Eclipse Awards. Earlier in the day, Richardson was honored by the Turf Publicists of America with the group's Big Sport of Turfdom Award. The award is given to key non-media figures in racing who cooperate with or provide expert information to the press. Today's Daily Racing Form has a nice article about the award and Richardson; here are a few salient quotes about Barbaro's current status. "He has steadily improved," said Richardson. "He's eating great. He hasn't been in a sling in over a week. The fact that he bounced back, and quickly, is very encouraging. It's still disappointing that he had a setback, but these types of things are not unexpected." "We've been able to decrease his pain medication," Richardson said. "He's not sedated. It's to address his hind foot." "But this was a significant setback, so I don't think he'll leave for at least a month, and it could easily be longer," Richardson said. "He's a smart, enduring, tough kind of horse," Richardson said. "I think this shows that a lot of horses can behave like this if given the opportunity. Most horses who make it this long go home. I'm hoping he's one of those. "It's awkward getting an award like this because we're not done. We haven't finished the job. Trying to reconcile that, I hope the award is for the effort that has been made, and for the ongoing effort. I hope something good comes out of this. I'm just a small part of this. Barbaro is the biggest part." Richardson said that if and when Barbaro is relocated to Kentucky, his care would be handed off, most likely, to Dr. Scott Morrison of Rood and Riddle Equine Clinic. They came from all over the United States. They also came from Brazil, The Netherlands, Sweden, Canada, and Great Britain, too. And they kept on coming, hammers in hand and trucks lined up. An estimated 181 farriers congregated in an arena outside Houston, Texas on January 11-13, to see, hear, and evaluate a concept called "World Championship Blacksmiths", farriery's newest experiment in entrepreneurship and originality. The WCB's "Super Clinic", presented by Anvil Brand Shoe Company, used a "who's who" of the game's top experts as instructors to draw in the attendees, but many were also curious to know what the organization might be like, and how it would run its events. WCB Chief Planning and Operations Officer Jill Ballard of Ithaca, Nebraska reported having trouble getting the attendees out of the arena at the end of the night. "We shut off the music, we told them it was over, but they just stayed and stayed," she told Hoofcare & Lameness on January 17. "Finally, we had to turn off the lights to get them out of there!" WCB has ten work stations but added rigs of member farriers to accommodate the demand from attendees to practice forging skills with the clinicians. After the formal lessons of the day, the work stations were opened for practice and Ballard said the attendees poured out of the stands and right to the work stations, ready to try what they'd just learned. While the corporation's purported mission is to run a national series of farrier competitions leading up to a grand finale championship, the Super Clinic was an educational first step. The clinic was offered free to farriers who wish to become members of the organizational side of the corporation, which already has over 200 members and has received "chapter" status from the American Farrier's Association, including a seat on the AFA's Board of Directors. The company was only launched in June of 2006 and is the first private company to be delegated chapter status by the AFA. A quick math calculation shows that nine out of ten current members of the organization attended the event. Clinicians were Jim Quick, Craig Trnka, Jason Smith, Jim Poor, Shayne Carter, Jim Keith, Mark Milster, and Austin Edens, as well as the current members of the American Farrier's Team, which represents the US in international competitions. All the clinicians have attained the level of the Certified Journeyman Farrier in the AFA. Current World Champion Blacksmith Billy Crothers of the UK also was part of the program; Crothers is an Associate of the Worshipful Company of Farriers in Britain. WCB Chief Executive Officer Craig Trnka of Albuquerque, New Mexico was pleased with the turnout and the program. "All the clinicians involved stuck to the core basics of horseshoeing and that's what made this clinic such a success," he said. The entire program was videotaped and projected onto a large screen so that attendees could see the workmanship clearly and at close range, while remaining comfortably seated. Media services were provided by Dan Burke, Dave Farley and Royden Bloom of Farrier Product Distribution in Shelbyville, Kentucky. DVDs from the event will be sold by WCB in the spring. In addition to Anvil Brand and FPD, sponsors included Centaur Forge, Life Data Labs, Vettec, and Emerson Horseshoe Supply. The next event on the WCB calendar, besides attendance or competition entries by most members at the annual convention of the American Farrier's Association in February, will be the first regional WCB competition, to be held in Bossier City, Louisiana on April 20-21. This will be competitors' first opportunity to attain points toward qualifyinig for the national championship. Barbaro remains in the Intensive Care Unit of Penn’s George D. Widener Hospital at New Bolton Center. Surgeon Dean Richardson clarified today that the horse's problem is the sub-quality hoof growth, not the cast itself, in an interview with Dan Gelston. "Barbaro has had a significant setback over the last 24 hours. He became acutely more uncomfortable on his left hind foot. The foot cast was removed and some new separation of the medial (inside) portion of his hoof was found. This required some additional debridement (removal of the damaged tissue) last night. "He is being treated much more aggressively at this time for his discomfort. He is continuing to eat well and is otherwise stable." The Third Veterinary Sport Horse Congress will once again be held in combination with the "Jumping Amsterdam" showjumping event on January 26-27 in Amsterdam, The Netherlands at the RAI Congress Center. The two-day program brings a unique atmosphere featuring international speakers from the USA, United Kingdom and Spain. On Friday January 26 different orthopaedic problems of the back, stifle, shoulder and foot will be addressed. One of the topics is the diagnosis and prognosis of collateral ligament injuries, presented by Jorge de la Calle DVM of Spain. Another highlight is a presentation about the risk of laminitis in sport horses and Andy Bathe's case-based presentation of lameness and poor performance evaluation. The second part of the afternoon contains topics about shoulder and back problems. On Saturday January 27, the main topics will be tendon and the Metacam Pain Management Panel, with an international panel discussing the (ab)use of medication in sport horses. One of the speakers in this pain management panel will be Dr. Frits Sluyter, a member of the veterinary committee of the FEI. International speakers at the Veterinary Sport Horse Congress are veterinarians Andy Bathe (UK), Jorge de la Calle (ESP), Rick Mitchell (USA), Jim Orsini (USA) and Frits Sluyter (SUI). The chair of the congress is Gertjan ter Heijden, equine veterinarian at the veterinary clinic in Zeddam (NED). In the evening, Jumping Amsterdam will present international show jumping. At Jumping Amsterdam 2007, sport and education will meet at the highest level! Note: On January 25th, a practical workshop on advanced ultrasound of tendons in sport horses will be held with teaching clinicians Hans van Schie and Andy Bathe (UK). This "Meet the Specialist" session will be held at the Veterinary Clinic in Emmeloord and is intended for veterinarians with advanced ultrasound experience. Bryan T. Fraley DVM will present a full day's program on laminitis and foot therapy at the North American Veterinary Conference in Orlando, Florida on Wednesday, January 17. Dr. Fraley is a foot-specialist veterinarian at Rood and Riddle Equine Hospital in Lexington, Kentucky, where he is works with Scott Morrison DVM on laminitis and other hoof problems. Morrison recently made headlines for his consulting role in treating racehorse Barbaro's laminitic left hind foot at the University of Pennsylvania's New Bolton Center. Fraley's topics will be: Acute Sinker Syndrome Diagnosis and Therapeutic Options, Management of Severe Foot Infections, Treatment Options for Acute and Chronic Laminitis, Brief Review of Some Interesting Podiatry Cases, and How to Apply Foot Casts with Axial Support for Sinker Syndrome and Cast Shoes for a Multitude of Foot Conditions. The conference, which continues through the weekend, will be held at the Gaylord Palms resort and conference center in Orlando. It is one of the largest meetings of veterinarians in the world. On Wednesday, January 3, Scott Morrison DVM of Rood and Riddle Equine Hospital in Lexington, Kentucky traveled to Kennett Square, Pennsylvania. Rattling around in his briefcase were strips of 3M Fiberglas casting tape, Goretex fabric, thick felt, Betadine and a large aluminum bar shoe. One can only imagine what that jumble looked like on the security screen. For once, TSA inspectors waved the veterinarian through. Morrison used those materials to create a temporary supportive foot cast for Barbaro, the champion 2006 three-year-old colt whose right hind leg shattered soon after the start of the Preakness Stakes last May. Since then, Barbaro has been a patient at the University of Pennsylvania's Widener Hospital for Large Animals at the university's rural vet school campus called New Bolton Center. In July and August, the colt fought the painful disease of laminitis in his "good" hind leg. He was left with one broken leg and one hoofless one, but he struggled to survive. The damage to his laminitic foot continues to be the greatest concern. Laminitis is the devastating disease that ended the lives of great racehorses like Secretariat and Sunday Silence, the Standardbred champion Nihilator, and more recently, the two great European champion dressage mares, Annastasia and Poetin. Morrison, who heads Rood and Riddle's innovative podiatry clinic, was sought as a consultant to assist with the foundered (a common term for a foot that has been ravaged by the disease of laminitis) foot. He first saw the horse on December 20 for an evaluation, then returned on Wednesday to try to help stabilize the foot. On Friday, January 5, Dr. Morrison told me that the cast was applied, "because the foot is so unstable. He's just not growing enough wall on the medial (inner) side, and he's bearing most of his weight on the arthrodesis (surgically-fused) leg." 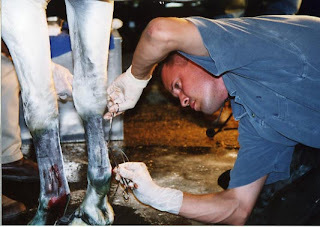 Morrison padded the bottom of the foot with thick felt soaked in Betadine (iodine solution); the hoof wall was padded with Goretex fabric padding which was then covered with 3M casting tape. The cast extends up over the pastern area to just below the fetlock, according to Dr. Morrison. "He lands on his toe when he walks," Morrison commented, "and that needed to be addressed. I had asked them to take radiographs before I got there, and they showed demineralization (thinning or actual deterioration) of the coffin bone (pyramid-shaped bone in the base of the foot, encased by hoof capsule) at the toe and on the medial (inside) wing. "I attached a big aluminum bar shoe to the bottom of the cast to help with derotation, to try to get that coffin bone more parallel to the ground." Morrison observed that the horse was uncomfortable at first with the change in footwear, but that surgeon Dean Richardson reported the horse was more comfortable with it the next morning. 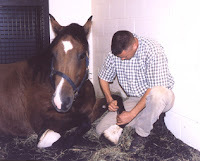 An ancillary purpose of the cast is to stabilize the foot in the event that the horse needs to be moved out of his intensive care unit home at New Bolton Center. Speculation is that the horse will be moved to an as-yet unnamed farm, possibly in central Kentucky, to continue treatment in a more active setting. No date has been announced for his discharge from New Bolton. Dr. Morrison is the founder and head of the podiatry clinic at Rood and Riddle; his unit is the largest such clinic in the world. The clinic currently employs four foot-specialist veterinarians and five lameness-specialist farriers, as well as a staff of technicians and administrative support staff. Morrison is a specialist in laminitis and consults on cases all over the world. He is also a consulting editor to Hoofcare and Lameness Journal. His most recent article chronicled the transplant of frog tissue on the bottom of an injured foot via the punch biopsy tool method; he was able to create a germinating bed of new frog tissue in a damaged area. Ironically, he is probably most renowned for an article detailing his use of sterile maggots to debride many cases of infected hoof tissue. That article can be downloaded at http://www.hoofcare.com. “The shoe on his right hind foot was further modified as his strength improved,” said Dr. Dean W. Richardson, Chief of Surgery. “We are aware that there is some public concern about his abnormal motion on the right hind limb, however, this is not unexpected. His gait may be abnormal as he learns to adapt to having fusions of two major joints in his lower limb and to the special shoe. 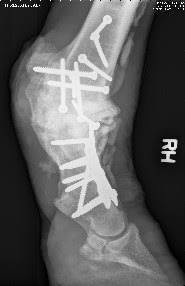 In addition, the fracture had some collapse on the medial (inside) part of the pastern region after he developed laminitis on the left hind foot. Although this is visually unattractive, the mechanics of the lower leg are not seriously affected because the pastern and fetlock joints are fused.